7.7.9 March, 12th 2019 Minor bugs have been resolved and improve file locking and hiding mechanism. 7.7.6 May, 28th 2018 The latest version of Folder Lock brings you improved compatibility, minor bugs being fixed & made more compatible to Windows 10. 7.7.5 April, 02nd 2018 The latest update of Folder Lock brings you improved security and the minor bugs are now fixed. 7.7.4 February, 21st 2018 This update brings you improved encryption, compatibility and minor bugs being fixed. 7.7.3 January, 26th 2018 The latest version of Folder Lock brings you improved compatibility along with minor bugs being fixed. 7.7.2 November, 17th 2017 In the latest update, some minor bugs have been fixed and the compatibility of this software has been improved. 7.7.1 August, 28th 2017 Minor bugs are fixed and the UI has been improved. 7.7.0 June, 30th 2017 In this version update, some minor bugs have been fixed and the performance of the features has been improved. 7.6.9 May, 11th 2017 Quick encryption along with improved user interface. 7.6.8 March, 20th 2017 Improved security and faster encryption along with minor bug fixes. 7.6.5 February, 28th 2017 Optimized and strengthened security algorithms for faster encryption and ease of use. 7.6.4 December, 01st 2016 Added Arabic language version with New Forgotten Password feature. 7.6.3 October, 04th 2016 Improved encryption algorithm with new German, French and Italian language support. 7.6.2 September, 17th 2016 German, Italian & French Language support in Folder Lock - More optimization with Windows 10 and a few tweaks to make encryption faster. 7.6.1 July, 14th 2016 In this version update for Folder Lock 7.6.1, cloud backup has been enhanced and minor windows 7 bugs have been resolved. In addition, the user-interface has been simplified, making Folder Lock more aesthetically pleasing and easier to use. 7.6.0 May, 05th 2016 New UI. Trial period expanded from 15 to 25 number of maximum uses. Bug fixes. Performance improvements. Completely compatible with Windows 10. 7.5.6 December, 18th 2015 The new version is updated to be fully compatible with Windows 10 PCs. Next, encrypted lockers have been improved, resulting in more efficient and quicker encrypting and decrypting cycles. Some minor bugs have also been resolved in this version update. 7.5.5 September, 15th 2015 In this version update, Folder Lock's source code has been modified to work on Windows 10. 7.5.2 June, 10th 2015 In this version update, security algorithm has been enhanced and some minor bugs have been fixed. 7.5.1 January, 15th 2015 In this version update, some minor bugs have been resolved with file locking and hiding mechanism. 7.5.0 November, 06th 2014 This is a major version update for Folder Lock 7 in which version 7.5.0 features a brand new user-interface. Other minor changes include enhanced encryption and decryption speeds. 7.3.0 June, 25th 2014 This update resolved major underlying bugs which were associated with Folder Lock secured backup feature. 7.2.6 April, 11th 2014 This version of Folder Lock works on the latest versions of Windows i.e. 8.1 and improves the performance of a lot of features. 7.2.5 February, 27th 2014 This version comes with improved security in user and system hacking related matters and it is therefore a essential update of Folder Lock. 7.2.2 June, 21st 2013 This update resolves a minor glitch that was related to decrypting of master password. In addition, encryption for the master password has further been fortified to ensure data security for the end user. 7.2.1 May, 16th 2013 In this version, minor changes have been made to the code associated with data encryption, resulting in quicker encryption and decryption of data stored within lockers. 7.2.0 March, 11th 2013 This version includes some important GUI enhancements and fixes a few glitches in secure backup module. This version is fully compatible on all Windows 8 OSes. 7.1.8 December, 04th 2012 This version update of Folder Lock resolves a minor issue related to Folder Lock's compatibility with Windows 8 - 32-bit operating system. 7.1.7 October, 26th 2012 This version update of Folder Lock fixes all known compatibility issues with Windows 8. It also removes minor functional bugs and improves overall application functionality. 7.1.6 October, 15th 2012 This version update of Folder Lock removes some minor issues in general settings and improves overall compatibility of the program. 7.1.5 September, 24th 2012 Folder Lock has been upgraded and enhanced to work with Windows 8 operating system. This version update also resolves user-reported issue related to encrypted Lockers. 7.1.1 July, 24th 2012 Maintenance update featuring better integrated security features. With this new version trivial issue have been resolved which were linked to renaming lockers, enhancements have also been made to the secure backup service for faster and trouble free data syncing and uploading. 7.1.0 June, 10th 2012 Major Update! This is the most awaited and bug fixed version of Folder Lock ever. With added features like better overall system and application performance, double click in Lock Files to run files, master password requirement to access all features by default, multi-login and syncing in Secure Backup, default uninstall password, drag and drop in all features, better integration between Encrypt Files and Secure Backup, easier to use Make Wallet and Protect USB/CD features, GUI enhancements and many other tweaks and fixes. 7.0.6 January, 13th 2012 Maintenance update featuring better interface to set Master Password. This update also fixes user reported issues, small functional bugs and minor compatibility issues. 7.0.5 December, 12th 2011 This version comes with increased functionality including Drag & Drop for Lock Files. Additionally, individual items can be Locked and Unlocked in Lock Files. Users also have the added ability to Lock and Unlock items from the Context Menu in Windows. A recommended update. 7.0.3 November, 16th 2011 This version comes with enhanced application interface overhaul which keeps ease of use as paramount to user experience including minor obstructive glitches, fixes with inter-application compatibility. 7.0.2 October, 07th 2011 This version fixes minor glitches including fixing Make Wallet and File Shredding modules. This version improves the application memory management and processing. Many other new enhancements and bug fixes. 7.0.1 September, 23rd 2011 The setup file and installed application size is reduced, thanks to the implementation of latest compression tools. This update also fixes minor glitches and bugs reported by our users and implements faster response time on click on buttons and tabs. Some improvements were also made in memory and resource management. This is the most up-to-date version of Folder Lock 7. 7.0.0 September, 17th 2011 We are proud to announce a major upgrade of our best-selling product, Folder Lock. Folder Lock 7 now comes with a newer, better and bigger interface. It is now a 7-in-1 data security application that lets you encrypt files, backup online, protect USB / CD, lock files, make wallets, shred files and clean history. Additional features include stealth mode, hack security, application level password security and automatic protection. 6.6.5 June, 21st 2011 This update works around small functional bugs, fixes some minor compatibility issues with Windows 7 and improves overall application functionality. 6.6.0 May, 10th 2011 This version includes maintenance updates and improvements for better compatibility and handling of the application. 6.5.8 March, 07th 2011 This version update of Folder Lock takes away some minor compatibility issues with Windows Vista 64-bit and improves overall application handling. 6.5.5 December, 24th 2010 Version update of Folder Lock 6.5.5 removes a few functional bugs, and improves overall compatibility of the program. 6.5.2 December, 06th 2010 Maintenance update, a few bug fixes, better support & compatibility for all variants of Windows 7. 6.4.2 June, 25th 2010 This version comes with some enhancements and bug fixes for Windows 7 64-bit OS, like fixed context menu in Windows Explorer, ability to save even 4GB or larger files in the Locker, fixed a few UAC related issues and improved performance. 6.4.1 April, 17th 2010 This is an important update with many GUI enhancements and improvements. Some important drag and drop functionality is added in the application when running in Windows 7.0 and portable preloader application is improved too. 6.4.0 March, 16th 2010 This is a major update version of Folder Lock featuring complete compatibility on Windows 7.0, both 32-bit and 64-bit flavors of Home Basic, Home Premium, Enterprise, Ultimate versions of Windows. There are many other enhancements in this version, improving the compatibility of program with other third-party software. 6.3.5 February, 12th 2010 Maintenance update featuring better integrity of Lockers, making them delete and copy protected. Furthermore, you can now give us feedback in the form of ideas and suggestions. This is a recommended update. 6.3.2 December, 04th 2009 This version solves the compatibility issue with Windows 7 64-bit and some Vista 64-bit machines where an error of services not running used to come when running the application. Other enhancements and bug fixes. 6.3.1 November, 19th 2009 This version includes selection of virtual drive letters and setting default Locker path. Locking now allows brute force protection for even sub-folders and files of locked items. Many other usability enhancements and bug fixes. 6.3.0 August, 29th 2009 Portability feature now supports all types of removable/external storage devices. Stealth Mode is enhanced to work with all 32 and 64 bit OS accurately. Also available in German language now! 6.2.4 May, 08th 2009 Windows Explorer context menu added in the GUI for encrypted files and folders. Easy to use Lock, Unlock buttons added in the Lock Screen for easy one click locking and unlocking. 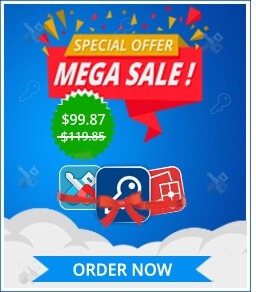 Options to allow you to get Folder Lock full version by simply subscribing or purchasing other products powered by Trial Pay and some GUI enhancements and bug fixes. 6.2.1 April, 30th 2009 Bug fixing on 64-bit Windows 7, GUI enhancements to accommodate more space as well as compressed / reduced setup file size. 6.2.0 April, 25th 2009 This version comes with locking feature even on 64-bit Windows (all versions). Windows errors and issues in few OSes are resolved. Other refinements include faster processing, better overall performance and a few GUI changes. 6.1.7 March, 02nd 2009 This is an enhancement update. A good looking about window and support for automatic update reminders added in this version, letting you know about new updates as they come. 6.1.6 February, 21st 2009 Folder Lock is now 64-bit Windows compatible on all flavors i.e. Windows Vista 64-bit, Windows XP 64-bit, Windows Server 2008 and also Windows 7.0. A new Portability feature is also added in this version, allowing you to protect data on USB drives and External drives without any hassle and without the need to install Folder Lock on the other end. 6.1.5 February, 12th 2009 64-bit driver, better usability and feedback solutions to improve the product. This version solves many previous issues and glitches. 6.1.4 January, 30th 2009 Drag and drop feature added in this version. Files of sizes more than 4 GBs can be added into the Lockers now. New explorer buttons added for easy navigation within the Locker. New blue theme based (.flk) Locker icons introduced for easy familiarity of Lockers. 6.1.3 January, 01st 2009 New kernel level functions and multiple protection procedures added in the core functionality of the product. This version fixes previous glitches and improves performance. 6.1.2 December, 12th 2008 This maintenance update fixes a few issues in the setup and registration schema, improving the overall performance and usability of the application. 6.1.1 November, 01st 2008 Issues in SCSI hard drives and mrm.exe are resolved in this version. Portable Auto Play executable feature added for portable security in USB and external drives. Issues with CD/DVD related data backup are resolved. Virtual Keyboard feature is added and major bug fixes and enhancements implemented in this version. 6.0.5 October, 18th 2008 Security settings are more enhanced, 0 KB Locker problem in Windows Vista solved, Windows Vista related bug fixes, play sounds feature is now working correctly and many minor bugs fixed. 6.0.1 October, 06th 2008 Major update! 256-bit AES on-the-fly encryption, locking and hiding of files, folders and drives, new easy-to-use User interface. Multi User capability with better Stealth Mode, Auto Protection, History Cleaning, Hack Attempt Monitoring and Shredding. Lockers can now be burned into a CD/DVD, can be copied to a USB Drive and can even be emailed or uploaded. 5.9.5 July, 07th 2008 Fixes and enhancements to improve overall security of the program. 5.9.2 June, 06th 2008 Uninstaller malfunction in some variants of Windows Vista fixed with better USB security if files are protected from within Windows Vista. 5.9.0 April, 28th 2008 Most bug free version with support for latest drive types and file systems. Tested in all variations of Windows Vista. 5.8.2 March, 09th 2008 Some enhancements and bug fixes. 5.8.0 November, 12th 2007 Major bug-free version with context menu enhancements and better portable drive support for latest versions of Vista. 5.7.9 September, 27th 2007 Protection in USB Drive and External Hard Drive is faster than before. A few major bug fixes and enhancements in this version. 5.7.5 May, 17th 2007 Tooltips added to the browse list so that you can easily see the complete folder paths in 'Unlock folders' list when you move your mouse pointer to the list. Any known conflict due to UAC feature in Windows Vista has been fixed. Many other fixes and enhancements. 5.7.3 April, 18th 2007 File size improvements - Folder Lock.exe is now only 750 KB and the setup file size is also reduced. This enhancement also fixes a few bugs on Windows Vista and Windows XP. Many other speed enhancements are done in this version and is therefore an important update. 5.7.2 March, 18th 2007 A few bug fixes and enhancement. Support for a variety of advanced options for Windows Vista. A new polished look, with new graphical look of buttons used in message boxes. More appeasing for Windows Vista and Windows XP. 5.7.0 February, 05th 2007 Major update. Folder Lock is now Windows Vista compatible with complete support for all its variant like Windows Vista Home Edition, Windows Vista Home Premier, Windows Vista Business and Windows Vista Ultimate. Now also supports Windows Multiple User Accounts in all 32-bit versions of Windows, so that different users of the same computer can have different security measures for their files and folders. Few other major enhancements and bug-fixes. 5.6.3 October, 25th 2006 Important update. Many bug fixes and new animated tips added in this release. Folder Lock now works faster when protecting files on slow USB Drives and now also support Memory Cards like SD Cards and the like. 5.6.0 July, 20th 2006 Enhanced support for all kinds of external drives and hard drives. This is a enhanced version, with some important bug fixes and improved component version changes. 5.5.7 April, 18th 2006 Important update, Folder Lock now allows you to power on/off the hacking attempt monitoring feature. An important bug fix with the activeX control (.ocx) when using Folder Lock on other than the machine it was installed on using removable media, requiring you to register the component. Other major fixes and enhancements and making it even more easier to get help within the program. 5.5.0 March, 20th 2006 Major update, this version adds new features like Password Strength Meter to tell you how secure your password is, based on factors like length and it's contents. New Getting Started Wizard added for the understanding of core functionality and features of the program. A better help system. Many major enhancement and bug fixes. 5.3.9 February, 26th 2006 Context menu problem when locking multiple files and folders has been resolved. Better help system with Tutorial for in-depth software functionality demonstration has been added in the help file. Other minor bug fixes and enhancements. 5.3.8 February, 06th 2006 Very important bug fixes. The freezing bug and activeX control problems with vaultskn.ocx have been completely fixed in this version. Folder Lock is also being tested on Windows Vista and new enhancements and recommended changes are also expected before the Vista release. 5.3.5 December, 05th 2005 This version adds a new feature that automatically locks the 'Locker' files and folders even if you forget to lock them and shutdown or restart your computer. It works only when the program is running at the time you shutdown your computer. 5.3.1 October, 22nd 2005 Fast protect your files on your USB Flash drives and other removable/portable media with the latest release. It adds ultra-fast speed to protect these types of media. 5.2.8 September, 28th 2005 External protection from trojans, added in this version, so that password-protected files cannot be damaged by online intruders/hackers even if they break into the computer. Many other important bug fixes and enhancements in this version. 5.2.6 August, 23rd 2005 Added brute-force attack protection in the program, which makes the password highly secure and unbreakable. Furthermore, conflicts on Korean and Japanese versions of Windows is also resolved. 5.2.5 August, 08th 2005 Added support for many different kinds of USB Flash Drives and Memory Sticks. Files can now be secured on any type of removable devices regardless of drive model/type. Many other minor changes and bug fixes. 5.2.4 July, 10th 2005 This update contains major bug fixes and enhancements to improve the overall speed of the program when locking or encrypting files on a USB Flash Drive. Additional layer of protection have been introduced when protecting files and folders in the 'Locker' folder. 5.2.1 May, 18th 2005 Folder Lock is now available in five languages, English, French, Dutch, Italian and Spanish. Many enhancements in this version, better uninstall, and a few new features like, allowing lock on multiple files easily by clicking the 'Another' button once you've locked a folder. 5.2.0 April, 04th 2005 Major Release featuring better context menu even for files, program works on all dpi settings now, ability to lock/unlock multiple folders or files at once via right clicking locked folder list. Password is now saved in the Locked folders as well for additional protection. A lot of other bugs fixes and enhancements. 5.1.6 February, 20th 2005 Freezing bug and truncated item bug in context menu is removed in this version. Also some major enhancements have been done removing all possible and known problems with this update. 5.1.5 February, 01st 2005 A new feature 'Lock Favorites' added. Adds troubleshooting section in the FAQ section. Stealth mode desktop icon problem solved. Trial limitations changed from 20-use trial to 35-use trial. 5.1.2 January, 15th 2005 A lot of bug fixes in this version. The password problem, the stealth problem and the DOS EXE problems are now solved. 5.1.0 December, 20th 2004 Stealth Mode, Shred files and Hacker Attempt monitoring features added in this release. Also added context menu in Windows Explorer. 5.0.8 December, 08th 2004 Automatic Operations, Erase PC Tracks features added. Now Folder Lock incorporates 256-bit Blowfish Encryption Technology unlike 128-bit used formerly. 5.0.5 November, 25th 2004 A polished version, fixes many bugs related to the Folder Lock skin component. 5.0.3 November, 10th 2004 Folder Lock adds a browse button in the program letting you lock any folder, even drives and also allows you to move the program to a removable disk for portable security. 5.0.1 October, 18th 2004 This release fixes a few bugs related to ActiveSkin component and adds multiple folder locking. 5.0.0 October, 01st 2004 This is the first release of the 5.x version. A major upgrade of the previous 4.x versions.